Matter, form and intention are essential for validity of the Mass. If any of these three is lacking, the Sacrament is not effected. (1) The matter is unleavened bread and grape wine. The form was discussed in a previous article titled Mysterium Fidei. Here I would like to address the topic of the intention of the priest in confecting Transubstantiation. Transubstantiation is necessary to confect the Sacrament of the Eucharist and the Holy Sacrifice of the Mass. I present this doctrine based on three very credible sources: the Summa Theologica of St. Thomas Aquinas, A Tour of the Summa by Msgr. Paul Glenn and Fundamentals of Catholic Dogma by Ludwig Ott, a widely used and highly respected textbook of Dogmatic Theology. In the Summa St. Thomas affirms: The minister’s “intention is required, whereby he subjects himself to the principal agent; that is, it is necessary that he intend to do that which Christ and the Church do.” (Part III, q 64, a 8). Another objection regarding intention is: Since at times ministers of sacraments are not attentive to what they say or do, but thinking of something else, the sacrament is invalid due to lack of intention. St. Thomas responds: “Although he who thinks of something else has no actual intention, yet he has habitual intention, which suffices for the validity of the sacrament. 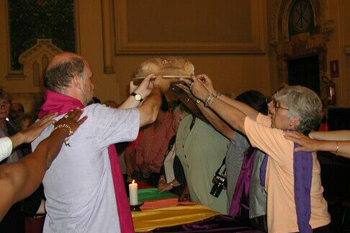 For instance, if, when a priest goes to baptize someone, he intends to do what the Church does. Wherefore if subsequently during the exercise of the act, his mind is distracted by other matters, the sacrament is valid by virtue of his original intention. “Nevertheless, the minister of a sacrament should take great care to have actual intention. But this is not entirely in man’s power, because when a man wishes to be very attentive to something, he can begin unintentionally to think of other things, as the Psalm says, My heart hath forsaken me (39:13)” (Part III, q 64 a 8, ad. 3). “According to the almost general opinion of current theologians, an inner intention (intentio interna) is necessary for the valid administration of the sacraments. 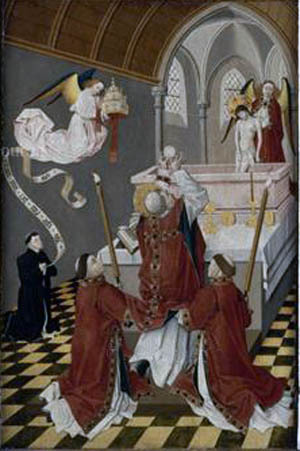 By intentio interna is meant an intention that is directed not merely to the external execution of the sacramental rite, but also to its inner signification. The mere external intention (intentio mere externa) … which is directed toward merely performing the external action with earnestness and in the proper circumstances, while the inner religious significance is not taken into consideration, is insufficient. 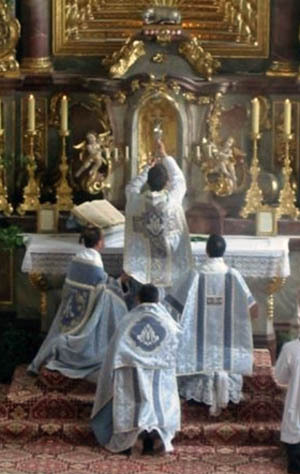 The crux of intentio interna lies in the fact that it is directed to inner signification of the sacramental rite, not merely the external execution of the rite. And external intention does not appear to fulfill the requirement of the priest doing what the Church does. As stated by Ludwig Ott above, to confect the Sacrament of the Holy Eucharist and simultaneously confect the Holy Sacrifice of the Mass supports the requirement for intentio interna, which mandates belief in Transubstantiation. Thus, Ott’s opinion is that intentio interna is indispensable to confect Transubstantiation. 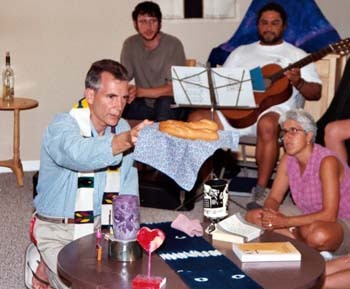 Another theological opinion maintains that a priest’s belief in Transubstantiation is not necessary for a valid consecration of the Eucharist. It states that if a priest says the proper words over the bread and wine and has the intention of doing what the Church does, then a valid consecration takes place even if he does not believe in Transubstantiation. The defenders of this opinion claim that it is implicit in a canon in the Council of Trent. Canon 11 states: “If anyone says that, in ministers, when they effect and confer the sacraments, there is not required the intention at least of doing what the Church does, let him be anathema.”(4) Thus, the expression at least gives the margin to affirm that the intention is required to confect the sacrament, but not the belief in the Transubstantiation. However, in opposition to this opinion, I believe that we can quote the same Council of Trent, which, in the 13th session of October 11, 1551, canons 1, 2, and 3, is quite clear in its demand of faith in the Transubstantiation. 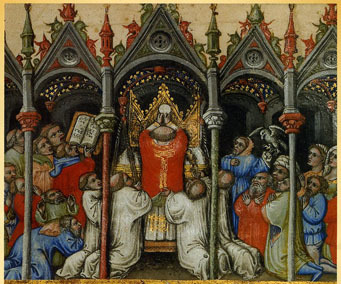 Based on these canons, and in the fact that Transubstantiation is a dogma of the Church reaffirmed many times by the official Magisterium and confirmed by many Eucharistic miracles, one can only wonder how a priest could possibly doubt the Holy Eucharist, and if he does, how he could effect the Transubstantiation. My own experience in questioning four post-conciliar priests who say Novus Ordo Masses, however, demonstrates that disbelief is more common than many realize. I asked each of them if they believed in Transubstantiation. Three said they believed in Hans Küng’s transignification (5) and one said transubstantiation was cannibalism. I specifically asked them if they intended to do what the Church does. In all cases, the answer was, no. These were priests who were committed to the Novus Ordo. They spoke of the Mass as a communal prayer service with the Priest presiding. Reception of Communion (never Holy Communion) was merely a sign of closeness, communion with Christ, quite in line with Küng’s definition of transignification. This is apparently what has been taught, in contradiction to Sacred Tradition, Scripture and the Extraordinary Magisterium. How many more priests formed in modern seminaries or in the new movements like the Neo-Catechumenal Way would also not believe in Transubstantiation and have no intention of doing what the Church does? These examples reinforce the theological opinion that it is necessary to have a clear internal intention to do what the Church does. Personally, I also defend that to intend to do that which you do not believe defies reason, logic and common sense. I believe the data presented in this article confirm this conclusion. The next article will describe the great Eucharistic miracle of Lanciano, a spectacular proof Our Lord gave a doubting priest in this Italian village to show that He is truly present in the Holy Host and Sacred Wine. 1. Decrees of the Ecumenical Councils, Georgetown Un. Press, vol. 1, p. 542; Denzinger, The Sources of Catholic Dogma, no. 695. 2. Msgr. Paul J. Glenn, A Tour of the Summa, TAN, 1992, p.
3. Fundamentals of Catholic Dogma, St. Louis: Herder Book Co., 1960, p. 344. 4. 7th Session of March 1547. The Latin text reads: Si quis dixerit in ministris dum sacramenta conficiunt et conferunt non requiri intentionem saltem faciendi quod facit ecclesia: anathema sit. 5. According to Küng, in “transignification” Christ would be in the bread and in the wine not as a physical reality, but only in the sense that they are signs of Christ for the community.